Any hopes I had for getting plenty of sleep on Friday were dashed quickly, as I spent most of the night tossing and turning. I mention this only because it affected my actions late Saturday evening, as you’ll see below. After breakfasting with pals I returned to the hucksters room for another day of wheeling and dealing. Sales of Murania Press product picked up, and by mid-afternoon I’d sold all available copies of our two most recent books, Blood ‘n’ Thunder Presents #4 and The Wild West of Fiction and Film. I also moved some of the collectable pulps and books on my table. Comics legend and old friend Jim Steranko stopped by for a lengthy chat, as did various PulpFest regulars I’d not yet had a chance to jawbone with. Periodic forays to tables manned by other dealers resulted in many purchases, some of them real bargains. 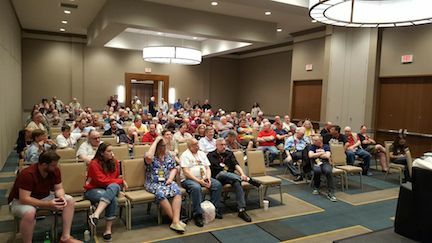 FarmerCon presentations and New Pulp readings (by Jim Beard, John Bruening, Win Scott Eckert, and Frank Schildiner) ate up the afternoon programming slots, and the day flew by rapidly. PulpFest held its usual Saturday-night dinner in the hotel, although for my evening meal I joined a large group that sauntered down the road to a local restaurant. We were careful to finish eating in time for the annual business meeting, at which PulpFest committee members Mike Chomko, Jack Cullers, Barry Traylor, and Chuck Welch assembled on the dais to face convention attendees. It was an unexpectedly dramatic session owing to Jack’s revelation that the committee—burned out after years of mounting the con—would be losing Chuck, who is moving with his family to Canada. This loss promised to further burden the already-overworked committee members. Jack then dropped a bombshell: PulpFest has received an offer to merge with a larger comic convention back in Columbus, our original home. Nothing has been decided but the committee is carefully weighing all options. The ensuing discussion was lively but brief due to time constraints. The business meeting drew a good-sized crowd. Following the business meeting David Saunders, son of famed pulp artist Norman Saunders and designer of the Munsey Award for distinguished service to the pulp-collecting community, bestowed this year’s award upon William Lampkin, editor of The Pulpster, which doubles as program book and annual magazine. Mike Chomko accepted for Bill—a well-deserved honor, in my view—and read a brief statement. 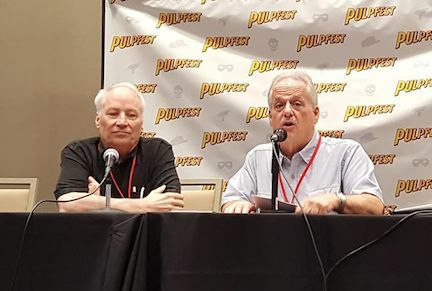 Tony Davis, long-time former editor of The Pulpster, interviewed the convention’s Special Guest, author Joe R. Lansdale, whose multi-media credits are too numerous to mention here. That discussion was followed by a David Saunders presentation on the art of war pulps and a panel discussing WWI themes in the work of Philip José Farmer, featuring Christopher Paul Carey, Win Scott Eckert, and Paul Spiteri. Although it’s embarrassing to admit, I skipped most of the Saturday-night programming out of fear I’d fall asleep and start snoring. Instead I mosied out to the Double Tree’s copious lobby and engaged in several lengthy conversations with various friends I’d not spent time with earlier. Tony Davis (right) introduces Joe Lansdale. The Saturday-night auction, another 200-plus-lot affair that promised to drag on for hours, got underway more or less on schedule shortly after 10 p.m. The Friday-night sale had been dominated by 12-issue lots of Wild West Weekly; Saturday night’s boasted similarly numerous batches of Western Story Magazine. But there were other interesting items as well, and I had my eye on one in particular: the 1941 issue of Thrilling Adventures that introduced Thunder Jim Wade in a novel credited to Charles Stoddard but actually written by prolific SF author Henry Kuttner. It came up late in the auction, when I was fighting to stay awake. I didn’t have much competition for the pulp and won it for a reasonable price. Bleary-eyed and somewhat dazed (more so than usual, that is), I shuffled up to the dais to pay for my item. You won two lots, I was told. No, I replied, just the one. Turns out I also won a pulp I couldn’t remember bidding on. That’s what acute sleep deprivation will do to you. After seeing the second item, a high-grade 1945 issue of Jungle Stories, I realized it was indeed something I would have competed for. Luckily, it had only cost me $30. In my zombified state I might have bid considerably more. At this point I should’ve called it a day and gone straight to my room, but upon passing through the lobby I spotted a large group in conversation. As they were all friends, I pulled up a chair and gabbed with them until the gathering broke up sometime around 2 a.m.
Fortunately, I got just enough sleep to be coherent the next day. 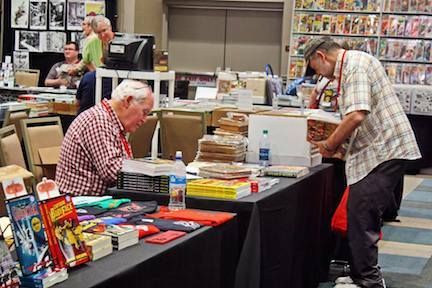 PulpFest’s Sunday session is always a short one; no programming is scheduled and dealers begin packing up at noon, even though the convention technically ends at 2 p.m. The worst part is saying goodbye to friends and fellow collectors I only see once or twice a year. The weekend always passes way too fast. Inscribing a book at my table. Photo by Scott Cranford. We were back on the road by 12:30 and reached my place in northern New Jersey some seven and a half hours later, at which time the Great White Whale disgorged a tired but satisfied quintet of pulp fans. So how did this year’s Pulpfest stack up against previous editions? On balance, quite well. It’s true that attendance was down and that dealer-room sales were not quite as robust as we would have liked. That speaks to an ongoing problem which deserves a separate discussion I might undertake here in a future post. Certainly the committee’s work was first-rate; Jack, Mike, Chuck, Barry, and their family members came through once again. I couldn’t detect any problems with the running of the show, although not having attended all the events I don’t know if any started egregiously late or were bedeviled by technical problems. PulpFest’s justifiably celebrated programming reflected the same careful thought and enthusiastic participation we’ve all come to expect. In the end, we all have to wonder if this admittedly small, specialized hobby is large enough and strong enough to sustain two national conventions. The first PulpFest, back in 2009, nearly tripled the attendance at the disastrous 2008 Pulpcon, which killed off that venerable confab. The second and third saw additional growth, but subsequent years—when we moved to downtown Columbus—found the show leveling off. The 2017 move to this current location was widely heralded for the excellence of the venue, but PulpFest has not had noticeable support from fans in Pittsburgh and the surrounding communities. Hence the decline in attendance. I don’t know what the answer is. I don’t know that there is an answer. But like I said above, the issue needs to be addressed. In the meantime, let’s all wish the PulpFest committee members well as they grapple with the tough decisions that lay ahead. Also at the auction were many lots of digest SF magazines in the best condition that I have ever seen. Excellent paper, new looking covers and spines, and the great scent of new magazines. New, despite being decades old! I bought the 5 lots of AMAZING because the digests were way better than my set but I probably should have just bought them all due to the amazing new looking condition. GALAXY, F&SF, ANALOG, IF, FANTASTIC, NEW WORLD, NEBULA, SCIENCE FANTASY, IMAGINATION, all were just about he best I’ve ever seen. As I figured part two was as well written as the part one. I do have to comment that as much as I love the chance to find pulps and books the thing that has kept me coming back for decades now are all the friends I have made over the years. Since I was not in attendance, this report came as quite a shock. My immediate thoughts were as much as New Pulp might fold easily into a comic con, I suspect vintage pulp and the pulp community in whole would be lost by such a merger. Since offering an opinion at a critical time of need is rather pointless if one is unwilling to step up, I have already contacted Mike Chomko and Jack Cullers with an offer to do just that. If we love Pulpfest as much as Windy City and love the entire pulp community as a second family, we need to put our money where our mouth is and commit. I feel that doubly as someone who did not attend because I was running a project out of state at the time. Bill, I’m sure any offer of help will be much appreciated by the committee. At the business meeting Jack made a special point of saying that previous pleas for assistance seem to have fallen on deaf ears. Having been active on more convention committees than I care to remember (and having chaired several cons myself), I know better than most people how draining it can be, year after year. New blood is urgently needed on the PulpFest committee, especially in the wake of Chuck’s imminent departure. I applaud you for offering to step up. An excellent write-up (both parts 1 and 2), as always; your take on the “Fest pretty much paralleled mine. mine general impression was that people in general seemed a little more tired than usual (not just the organizing committee), but that could just have been me. Like you and Barry, it’s the chance to socialize and see friends that keeps me coming back over the years. I neglected to mention this. I did not think after we had Gloria Stoll as our GOH in 2017 we could come up with a GOH as excellent as she was. Boy, was I ever wrong as Joe Lansdale was great. I was lucky enough to sit next to him at the group dinner Saturday evening and he had me laughing so hard I was afraid I’d cough up a lung. The back story on this is that a part of Barry’s lung did get coughed up at dinner…along with an ancient Robert A. Heinlein story (of which he has digested many over the years) More’s the pity that it was too late to put this exotic treasure into the auction for it would’ve fetched a pretty penny!